SK Hynix has added GDDR6 memory chips to its product catalogue, revealing their general specifications and launch timeframe sometimes in Q4 2017. As expected, the new GDDR6 ICs will be available late this year and will run at speeds not achievable by GDDR5. GDDR5 is not really going away as SK Hynix has added several new SKUs into the catalogue, targeting forthcoming applications. SK Hynix formally announced plans to produce GDDR6 in late April, so the addition of appropriate chips to the company’s databook does not really come as a surprise. 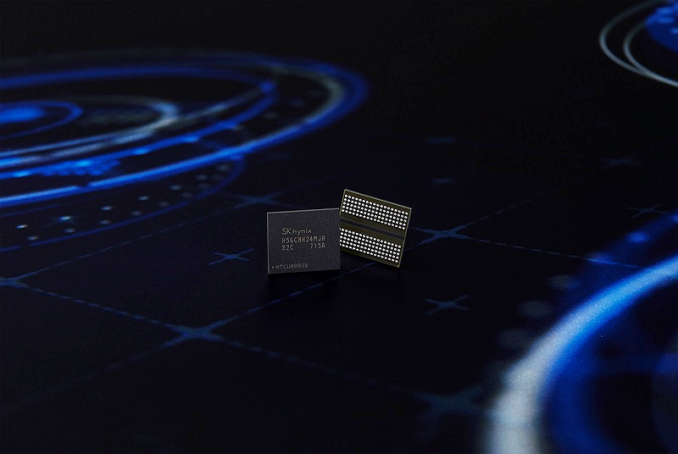 The initial GDDR6 chips from SK Hynix will have an 8 Gb capacity and will feature 12 and 14 GT/s data transfer rates at 1.35 V. The new memory ICs will have a dual-channel 256Mx32 organization, which may indicate that GDDR6 chips will keep using 32-bit physical interface, but that I/O will operate as two 16-bit interfaces at all times to increase effective utilization of the bus (but this is a speculation at this point). The ICs will use 180-ball FCBGA packages and will thus be incompatible with existing GDDR5 and GDDR5X applications that use 170-ball and 190-ball form-factors, respectively. JEDEC yet has to finalize and publish specifications of GDDR6 and this is when we learn everything about peculiarities of the new memory. From SK Hynix we already know that the maximum planned data rate of the new memory will be 16 GT/s, implying a 16n prefetch and higher base clocks. We also know that one of the first graphics cards to use GDDR6 will have a 384-bit memory sub-system and assuming that it will run DRAM at 14 GT/s, it will feature 672 GB/s of bandwidth. Keep in mind that developers of GPUs and makers of graphics cards are rather conservative about memory frequencies, so, the final bandwidth could be lower, depending on yields of GPUs, DRAM ICs and graphics cards. Besides GDDR6 memory, SK Hynix will also release 8 Gb GDDR5 chips rated for 9 and 10 GT/s data transfer rates at 1.55 V in Q4 2017. The new chips will target mass market applications that require higher memory bandwidth as well as cost efficiency of GDDR5, so, think of mainstream graphics cards. In addition to ultra high-speed GDDR5 devices, SK Hynix will also offer 7 and 8 GT/s GDDR5 chips with reduced voltages in the fourth quarter. The insertion of the new chips into the roadmap indicates that GDDR5 will remain on the market for at least a couple of years down the road and will celebrate a decade on the market next year. Speaking of graphics memory in general, it is also noteworthy that SK Hynix has removed mentions about HBM2 chips with 2 GT/s data rate from its product catalogue last quarter. As of now, the only HBM2 offering listed by the company are 4 GB 4Hi stacks with 1.6 GT/s data rate. The reasons for the move are unknown, but it is logical to assume that it is not easy to make very complex memory devices with a 512-bit I/O bus and high frequencies both from yields and from thermal points of view. Therefore, for products like AMD’s upcoming Radeon RX Vega, SK Hynix will have to offer HBM2 chips with 1.6 GT/s data rate and 204.8 GB/s bandwidth and it will be up to the buyers of such chips to implement further binning to higher frequencies.